When it comes to naming organic compounds, a molecule with a single functional group is easy. Simply follow the puzzle piece approach to naming organic compounds. 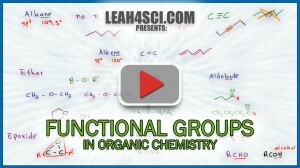 What happens when you have more than one functional group present on the molecule? That’s where this Functional Group Priority cheat sheet (scroll down) comes in. Find the highest priority group and make that your ‘functional group’. The lower priority groups get ‘demoted’ to a substituent with regards to naming rules. The higher the oxidation number of the group, the higher it tends to rank. In simple terms, a functional group with MORE bonds to oxygen will outrank one with fewer bonds. I can’t seem to get the image without the huge label on top of it. Anyway I can get the unblocked image? I’m having trouble getting the image without the huge “Functional Group Cheat Sheet” label over it.. is there a link to just the document?